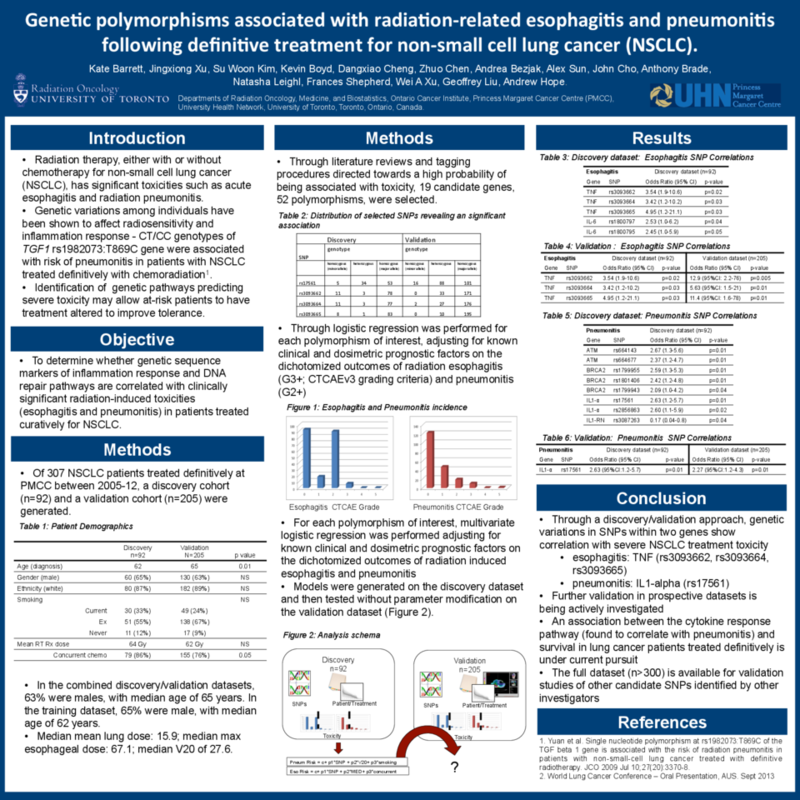 Purpose: To determine whether genetic sequence markers of inflammation response and DNA repair pathways are correlated with clinically significant radiation-induced toxicities (esophagitis and pneumonitis) in patients treated curatively for NSCLC. Materials and Methods: From 307 NSCLC patients treated definitively at PMCC between 2005-2012, a discovery cohort (n=92) and a validation cohort (n=205) were generated. From 19 candidate genes, 52 polymorphisms, directed by literature and by tagging procedures, were selected systematically for assessment. Multivariate logistic regression was performed for each polymorphism of interest, adjusting for known clinical and dosimetric prognostic factors on the dichotomized outcomes of radiation esophagitis (G3+; CTCAEv3 grading criteria) and pneumonitis (G2+). Additive genetic models were used for genetic association analysis. In the training set, genetic variants, genotyped by IlluminaGoldenGate, with p<=0.05 were identified for validation; HWE was set at p>0.01, a criteria met by all polymorphisms with statistical significance. Results: In the combined discovery/validation datasets, 63% were males, with median age of 65 years. Specifically in the training dataset, 65% were male, with median age of 62 years, median mean lung doses of 15.9, median max esophageal dose of 67.1 and median V20 of 27.6. After adjusting for concurrent chemotherapy and max esophageal dose, three TNF SNPs (rs3093662, rs3093664, rs3093665) were significantly associated with esophagitis (OR = 12.9 (95%CI: 2.2-76) p=0.005; 5.63 (95%CI: 1.5-21) p=0.01; 11.4 (95%CI: 1.6-78) p=0.01, respectively). For pneumonitis, adjusting for V20 and smoking status, IL1-α SNP (rs17561) was associated with pneumonitis (2.27 (95%CI:1.2-4.3) p=0.01). 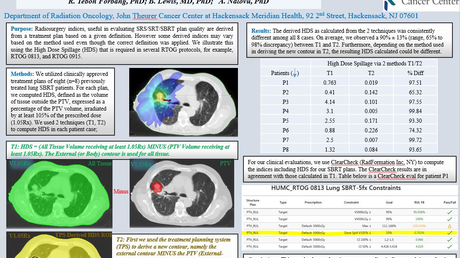 Conclusions: Through a discovery/validation approach, genetic variations in TNF and IL1-α correlated with toxicity following definitive NSCLC treatment. These results require validation with external datasets.